EDB file is core of Microsoft Exchange Server and Active Directory. ESE database (.EDB file) coordinates with EDB log file for data retrieval and transaction management. But faulty hardware drivers, server upgrade & system incompatibilities formulates Jet Engine (read & write) errors that consecutively abandons to mount database. Such recurring errors, necessitates Exchange EDB to PST conversion so as to repair damaged private & public EDB file and open EDB without Exchange server. Exchange EDB file repair software grants access to offline database and convert EDB to PST file, along with recovers deleted emails with attachments. Completely extract mailboxes from edb file to PST files without missing a single data bit. With accuracy export EDB to PST files by saving all email properties. This application works perfectly even when error percentage is very high & recover EDB file completely. Do complete Exchange EDB recovery of orphan, inaccessible, offline & unreadable database. If Exchange database is highly corrupted then use "Deep Scan" option for more precision. EDB file conversion tool saves properties like – to, cc, subject, from, bcc, attachments, appointments, events, & export EDB file. Also save personal & public folders properties. EDB file repair tool restores deleted or shift deleted emails from database. Along with retains attachments, appointments, dates & events of emails while fixing EDB2PST file. 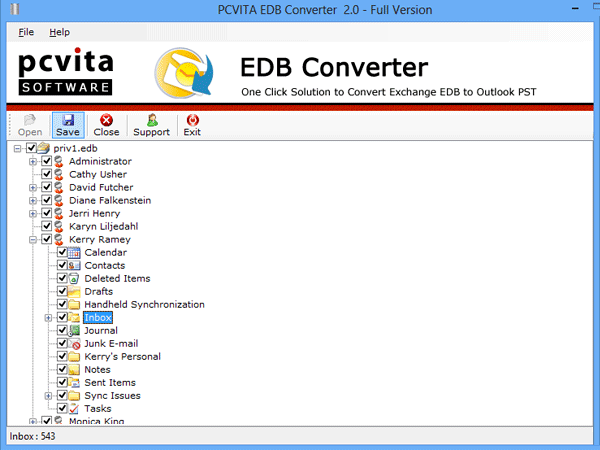 EDB to PST Converter support to extract all mailboxes at once. User can also do conversion of selected mailboxes (single & multiple). Software also reveals the item count per folder. EDB Repair tool provides an option to skip undesired mailboxes even after conversion has begun. On clicking Skip Button the particular mailbox is passed over & extraction of others' continues. It's A Powerful Application i.e. Compatible with MS Exchange Server 2013, 2010, 2003, 2007, 5.5, 5.0, 4.0! Check screenshots to understand the software functionality, to convert multiple EDB files to PST file format. In just 3 steps, you can convert any number of EDB files to PST format. Step 1 :Startup screen of EDB Converter software. Step 2 : All EDB folders are shown in original folder hierarchy. Step 3 : Currently running EDB file conversion process. Is it necessary to install MS Outlook in our systems to perform conversion? Yes, Installation and Configuration of MS Outlook is important, to perform conversion of EDB files into PST in your system. Can this Software support Exchange Server 2016? Yes, this application will support the Exchange Server 2016 and can export highly corrupted EDB files into PST Outlook format. Can the Application be used to convert Exchange archive mailboxes Database? Yes, the converter will easily convert the archived Exchange mailboxes even without the installation of Exchange Server in the system. Is there any size limit requirement for EDB files conversion? No, there is no size limitation for EDB files conversion. Both 32-bit and 62-bit machines can support the 2GB and more size of Exchange file conversion. "Sometimes back I was in a need to convert multiple Exchange database files into PST file format. I tried many tools but unable to complete the process as all these applications were providing solution to convert only emails. Meanwhile, I came across this EDB to PST Converter. I tried its free version to check its functioning and then purchased its full edition to save the entire database. Thanks to all who worked behind this tool." "I do recommend to use EDB PST converter because of it is ease of use and also it restored all my accidentally deleted mailboxes. This converter works like pro and has solved all my problems of data on the Exchange server. I just have to choose the EDB file and rest the software did." "This used to be my personal concern that buying products online is not safe. But, my friend recommended me to use this product because I wanted to migrate EDB mailboxes to PST. Beleving on his thought, I purchased the app and it cleared out all my doubted conceptions related to online products. The best thing was that it does not require any knowledge of the Exchange server. Thank you guys!!" "It is quite a difficult process to convert multiple mailboxes in PST but this tool makes it look simpler. I can easily understand, what steps to do next. 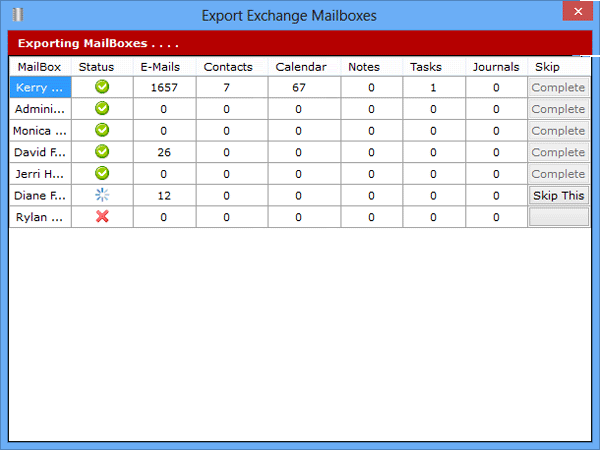 EDB converter even gives me the view of EDB mailboxes, which help me a lot while conversion. It is worth to spend money on this application. I will surely recommend this tool to every Exchange user for performing such conversion." Download EDB Recovery Software Free & Buy Licensed Utility Later! Conduct highly effective recovery of PST file supporting all versions of Microsoft Office Outlook (2000, 2002, 2003, 2007 & 2010). Recover deleted items and repair all damages. Top class utility for converting damaged, inaccessible, orphan, offline and unreadable OST file into Outlook PST file. View OST file items & also restore deleted items. High class application for easily exporting Outlook PST files into EML, MSG and PDF file format. Also attain the best technique to convert PST contacts into VCF file. Copyright © 2007-2017 edb-pst.net | All Rights Reserved.